1. Wake up extra early on any day office people have to go to work. 2. Get to the Nintendo World Store before 8:30 a.m.
3. Wait in line outside till the store opens at 9 a.m.
4. Wait in line inside cause the registers are slow. 5. Ask for a copy of Wii Play cause it comes with a Wiimote, costs only $10 more than just a Wiimote, and the games are simple but fun. 6. 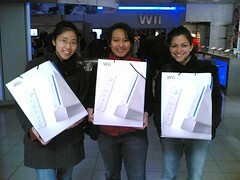 Buy your Wii. Hurrah!